Local shares felt the pain yesterday with traders remaining in a cautious mood ahead of key central bank meetings. 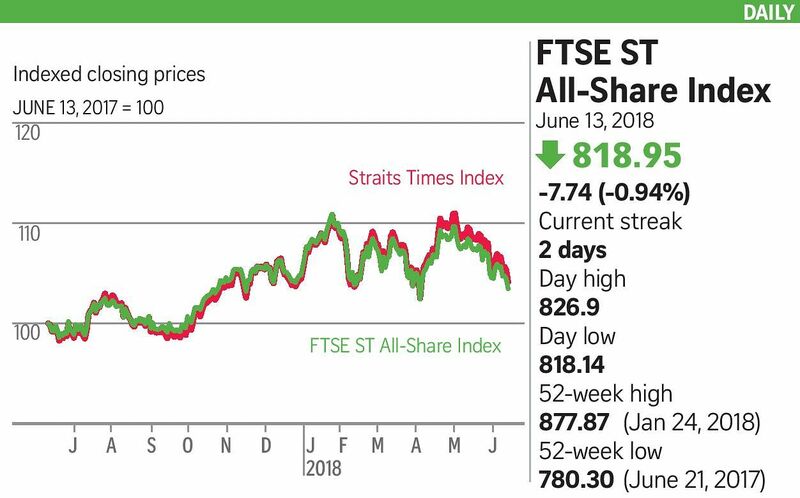 The wary sentiment sent the key Straits Times Index down 38.18 points, or 1.11 per cent, to 3,392.51, in line with most Asian markets. Turnover came in at 1.48 billion shares worth $1.21 billion, with losers outpacing gainers 285 to 143. Losses were led by declines in all three banks, with United Overseas Bank falling 76 cents to $27.10, DBS slipping 32 cents to $28.16, and OCBC Bank down 24 cents to $12.30. Ezion Holdings was the day's most active with 120 million shares worth $10 million done. It fell 0.6 cent, or 6.6 per cent, to 8.5 cents. Lifebrandz closed unchanged at 1.2 cents. The lifestyle group posted wider losses for the third quarter, mainly due to higher expenses. Fears over trade wars linger with a growing sense that major US trading partners China and the European Union, as well as North American Free Trade Agreement partners, may impose retaliatory tariff measures. But traders have issues closer to hand. First off is the US Federal Reserve's meeting where a 25 basis point rate hike seems to be a shoo-in, while the jury is still out on whether the Fed may take a more hawkish stance on its tightening policy. Analysts say there is a chance the Fed may favour faster rises given key data, including inflation and payrolls, that suggest a strong momentum for the US economy. US stocks shrugged off the outcome of the historic US-North Korea summit in Singapore with the consumer price index coming in largely in line with expectations. Key US indices remained relatively unchanged overnight. Another major event to watch is the European Central Bank's (ECB) meeting today. The market is anticipating the quantitative easing tapering process to conclude completely by the year end. But ECB chief economist Peter Praet's remarks that it "will have to assess whether progress so far has been sufficient to warrant a gradual unwinding of our net purchase" altered the narrative. The Bank of Japan meets tomorrow for its policy meeting with few fireworks expected. In Singapore, economists polled by the Monetary Authority of Singapore for its latest quarterly survey maintained their gross domestic product growth forecast at 3.2 per cent this year - versus official forecasts of between 2.5 and 3.5 per cent, while a labour report showed slight improvements in the first quarter.